Since 2004, Tour Edge Golf’s Exotics brand has been one of more technologically advanced – and successful – brands in golf, particularly in regards to fairway woods. Glod said the Slip Stream sole minimizes turf contact, allowing the head to maintain maximum speed through impact and is designed so that minimal turf contact occurs regardless of the attack angle and position of the head at impact. 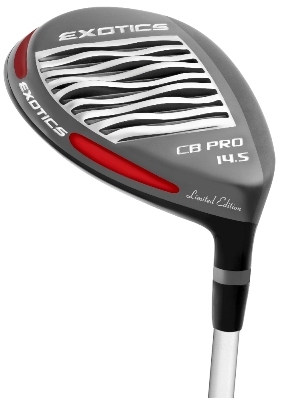 The CB Pro also features Tour Edge’s beta titanium cup face with a hyper-steel body that helps make the company’s metal woods among the hottest on the market. The no-weld design combo, Glod said, brazes the beta-titanium cupped face with the heavier hyper steel body, so that every gram of excess weight is eliminated from the face and shifted to the sole for a lower center of gravity position in the compact head. In addition, the CB Pro features the same trampoline face design found in the CB2 that combines multiple levels of face thickness. The CB Pro is being combined with the popular Fujikura Speeder 757 and 661 shaft. Fujikura 661 is a 65-gram shaft that’s geared towards better players with above average speeds. The Fujikura Speeder 757 features a new upgraded version of the original Speeder 757 featuring Triax Core Technology – a three-axis system of fibers that are woven in three directions rather than just two to stabilize the shaft) and additional Nano Alloy resin (high modulus carbon fiber).